Quilting has helped me through some difficult times in my life. The quilts I make all have precious tyes in some way. crochet, cross stitching exercise and being a mom which are all precious tyes to me. This blog will be about all of these things but mainly about quilting and how it is tied into my life. The above wall hanging was designed by me and published into a pattern called Homespun Memories. My blog is also about my Nifty Fifty Quilting swaps which are 50 state quilt block swaps that I started organizing over 10 years ago when my husband was going through depression. It helped me through a very difficult time. We have swapped over 70,000 quilt blocks during this time with many stories that traveled across the country along with our state quilt blocks. Our groups also make charity quilts for Breast Cancer Awareness. Any thoughts from the quilters out there for another Nifty Fifty Swap? 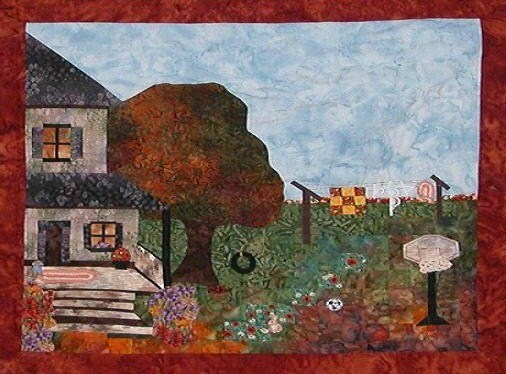 I have been quilting for over 20 years and my favorite type of quilting is handwork. I created the Nifty Fifty 50 state quilt block swaps where a group of quilters from across the country swap state quilt blocks and make charity quilts for Breast Cancer Awareness. Our most memorable themes in our swaps are the Redwork, Sunbonnet Sue, Snowflake, 50 State Flowers, Amish, Civil War, Batik, Patriotic in Rememberance of 9/11, Native American, 1930 Repro and Carol Doak's paper-pieced stars. I am a mother of four grown kids and a grandmother. I have worked for the same Orthodontist for the past 32 years. When I am not working at the office I am teaching piano at home, designing quilt patterns, and I occasionally teach quilting classes.